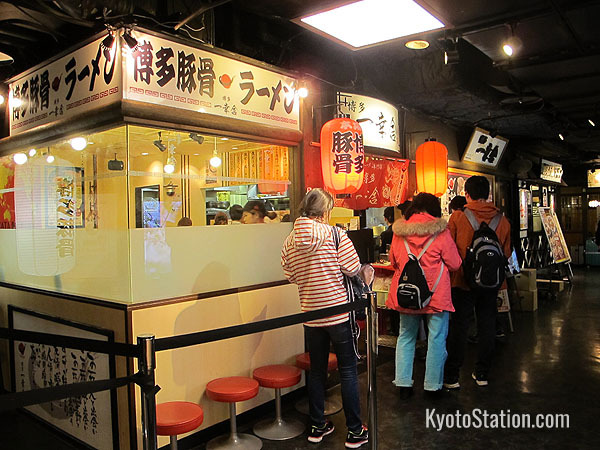 Kyoto Ramen Street (Kyoto Ramen Koji) is a corridor of ramen noodle shops on the 10th floor of the station building, south of the “Daikaidan” Grand Stairway. If you want something quick, cheap, tasty and super satisfying to eat, then this place is for you. Ramen, a simple dish of wheat noodles in soup, has its origins in Chinese lamian noodles and became a popular fast food in Japan in the early 20th century. Today every region of Japan prides itself on its own variation of this simple dish. Ramen can be served with different soup stocks, different toppings and noodles that come in various shapes, lengths and thicknesses. 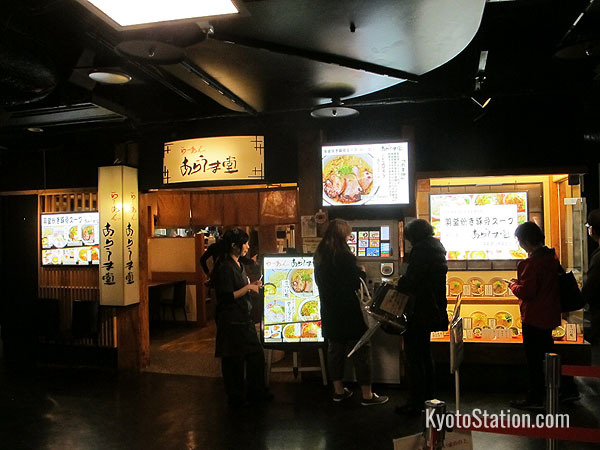 Kyoto Ramen Koji is in effect a noodle “theme park”, where you can find eight shops selling eight different regional varieties of ramen, ranging from Hokkaido in the far north of Japan, to Kyushu in the south. 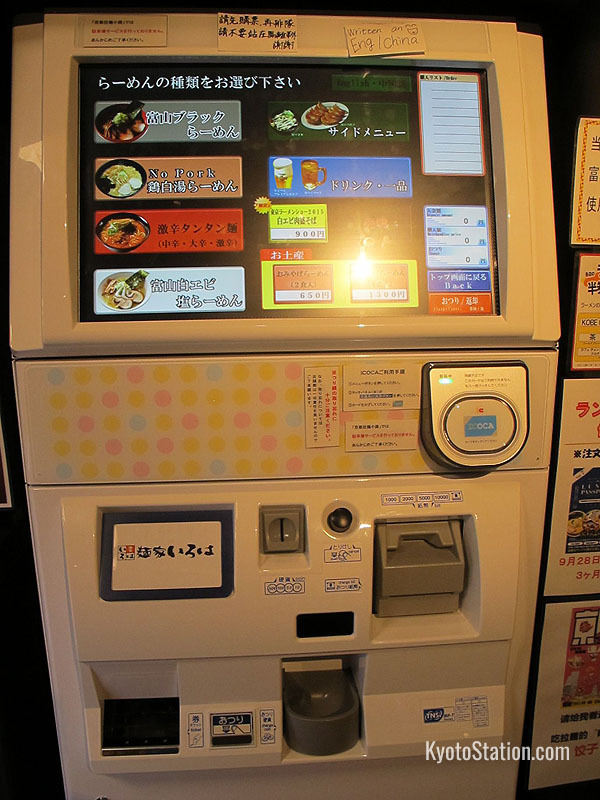 To order a bowl of ramen you have to first buy a ticket at a vending machine in front of each shop, and then pass your ticket to a cook behind the counter. 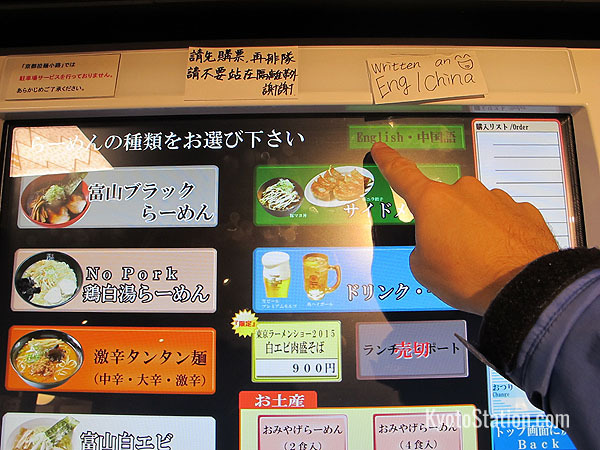 The vending machines are easy to use as they have plenty of pictures and an “English” button too. Look for that English button! Let’s take a look at the varieties on offer. 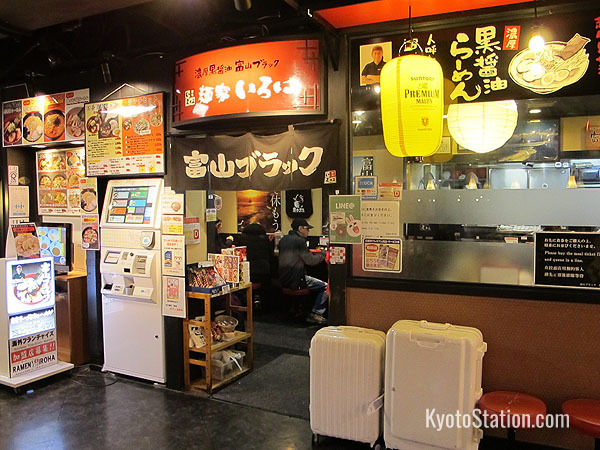 This is a branch of a famous ramen shop in Sapporo, Hokkaido; the northernmost part of Japan. The rich tonkotsu pork bone broth is served with thick curly noodles and enlivened with seafood, vegetables, garlic and spices. You can choose soup flavored with salt, soya sauce or miso paste, but the miso is especially popular as Sapporo’s miso ramen is considered one of the 3 best varieties in Japan. As it originates in cold northern climes, this soup has a thin layer of pork fat over the surface that keeps the contents piping hot! 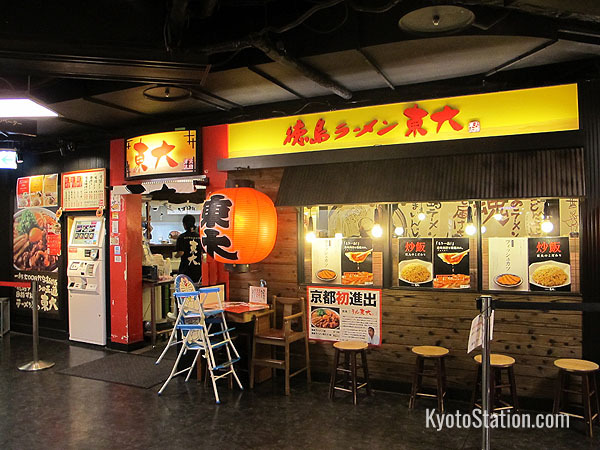 Bannai Shokudo serves Kitakata ramen, which is the second of the 3 top ramen varieties in Japan, and originates in the city of Kitakata in Fukushima. Thick chewy curly noodles are served in a salty tonkotsu pork soup flavored with sardines and soy sauce. This is all topped off with simmered slices of juicy pork belly. 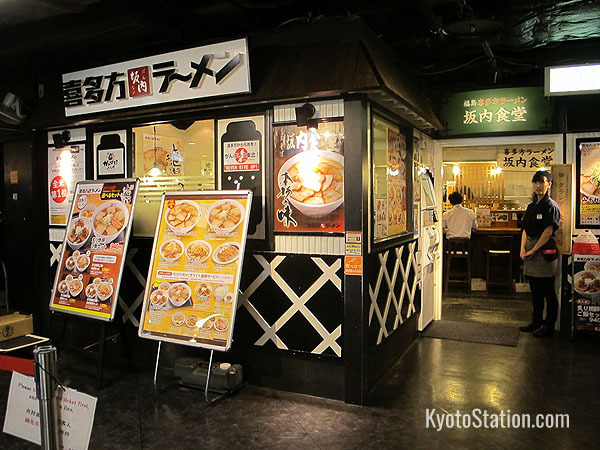 Here you can try a variety of ramen that hails from Ikebukuro in Tokyo. 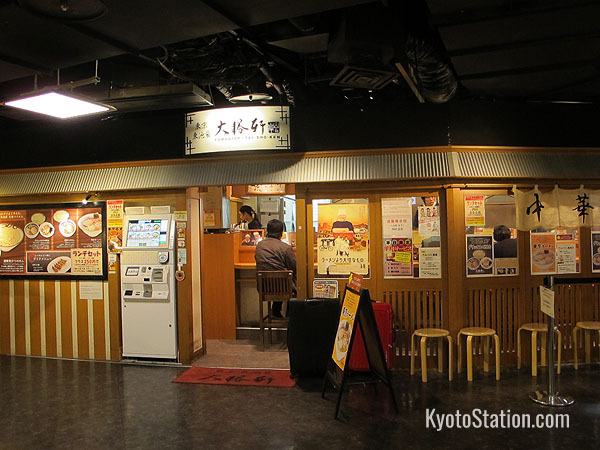 It was there in the original Taishoken ramen shop, that Kazuo Yamagishi invented his dipping ramen. Cold noodles are served separately and then dipped into a hot pork and chicken bone soup. The soup comes with a variety of toppings: pork, minced meat, vegetables, smoked mackerel and dried sardines. 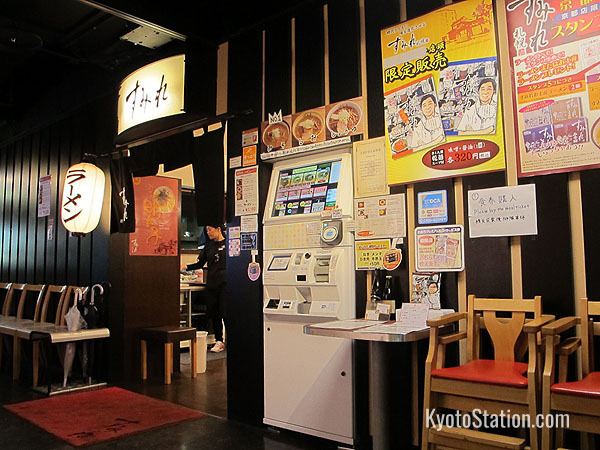 This shop serves a famous ramen variety from Toyama Prefecture. The key ingredient is a fish based soy sauce that is boiled for many hours and gives the soup a distinctive black appearance. Despite its striking color the taste of this “Toyama Black “ ramen, though rich, is actually quite mild. Three different types of Toyama Black soup are available: chicken and pork bone broth, a vegetable soup, and a soup made with kelp and dried bonito. 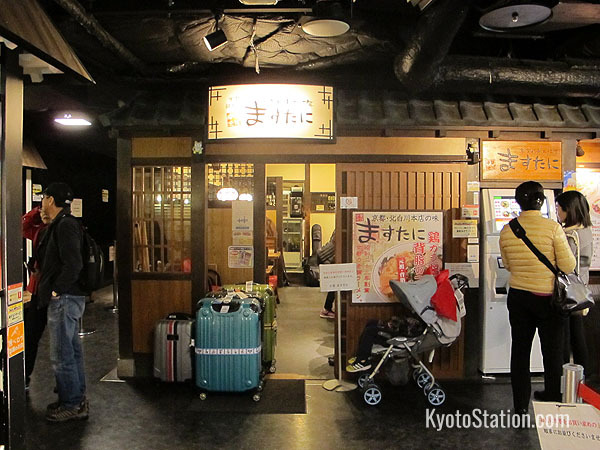 This shop is from neighboring Osaka and the main branch is actually in Osaka Station. Chicken and pork bones are boiled for many hours to create a thick broth that is then garnished with a special “Tamayu” sauce of condensed onions and garlic. This flavorsome soup comes in three varieties: soy sauce, salt or miso. These are thin noodles in a thick pork and soy broth with a strong taste and chunks of pork fat floating in it. Masutani is a Kyoto based brand of ramen which was established in 1948 and for local people has a somewhat nostalgic flavor. From Tokushima on the Island of Shikoku this ramen is characterized by its sweet broth of pork and soy sauce, served with slices of pork belly, spring onions and a raw egg cracked on top. It is customary to eat this concoction with a serving of white rice. 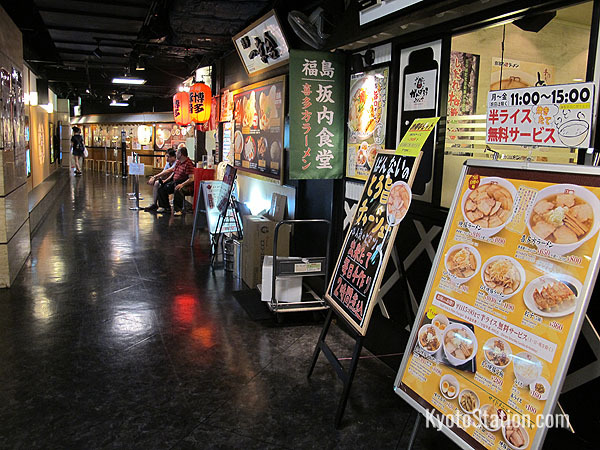 Ikkousha serves Hakata ramen from Fukuoka city on the island of Kyushu. This is the third of the top 3 ramen varieties of Japan. It is renowned for its rich, creamy pork broth, seasoned with 3 kinds of Fukuoka soy sauce and five kinds of fish stock. The thin, firm noodles are topped off with pork slices that are stewed in a secret sauce and other toppings of your choice like spring noodles or boiled egg. In the event that you don’t like ramen, but you are selflessly accompanying a friend who does, there are some options for you too. 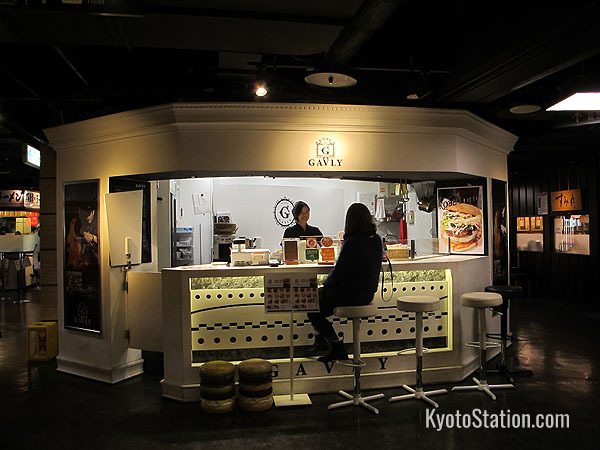 Kobe Gavly is a burger bar serving juicy hamburgers made with juicy Kobe Black beef, sandwiched with ten different veggies into soft spongy sesame seeded buns. 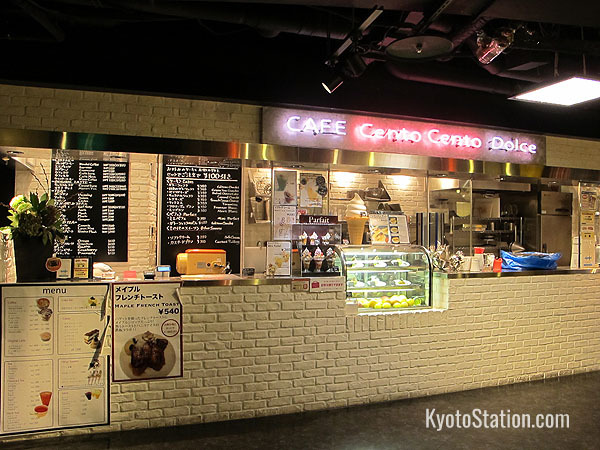 Cafe Cento Cento Dolce is a café and cake shop. 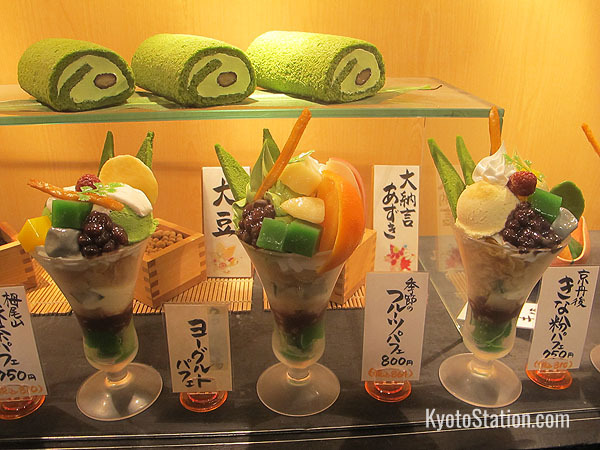 All the cakes and puddings are handmade, and on the drinks menu in addition to drip coffee, they serve a caramel latte and various flavored and herbal teas. 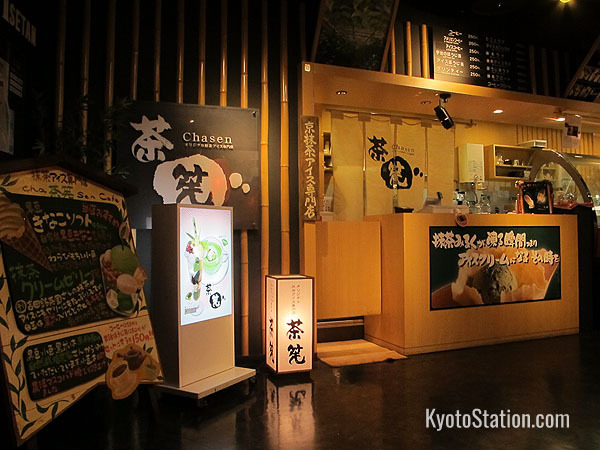 Chasen sells matcha (green tea) flavored ice cream, parfaits and waffles that are grilled on the spot.